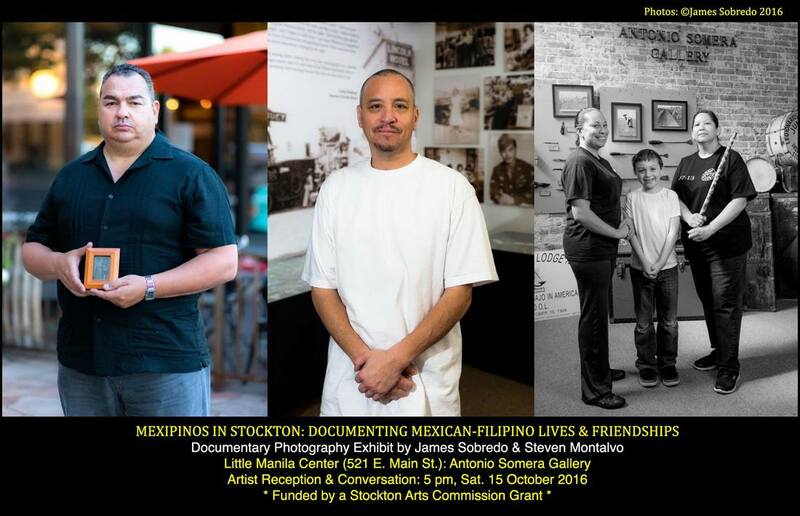 Mexipinos in Stockton is a photo-documentary exhibit that captures the images and stories of "Mexipinos in Stockton": Mexipino is a term used by Prof. Rudy Guevarra to describe a multiethnic Filipino-Mexican who represents "the coming together of two cultures, one Filipino, one Mexican." Filipinos and Mexicans comprise two of the largest ethnic groups in Stockton: Mexicans comprise 35.7% of the population and Filipinos, the largest Asian group, comprise 7.2% (Census). In Stockton and California, Filipinos and Mexicans have a long history of collaboration; for example, UFW co-founders Dolores Huerta and Larry Itliong were both from Stockton. Stockton residents James Sobredo and Steven Montalvo have been working together collaboratively for the last 17 years on photography projects. Dr. Sobredo, a Filipino American documentary photographer, is an associate professor of Ethnic Studies at Sacramento State University, and Montalvo, a Mexican American photographer, is a retired peace officer and social worker. This Project is also an expression of the long-term friendship between Montalvo and Sobredo: a Mexican and Filipino friendship. In those years, Montalvo and Sobredo have presented their photography in San Francisco, Oakland, New York, Sacramento and Stockton. *Mexipinos in Stockton is funded by a grant from the Stockton Arts Commission. Sobredo has been a Stockton resident for 25 years & also lives of Sausalito (11 years). His photographs on Filipino workers in Aklan, Manila and China were featured in a solo photo exhibit, FILIPINO TRANSNATIONAL MIGRATION, in San Francisco and Stockton. His works have been published in the NY Times, AsianWeek, Filipinas Magazine & The Smithsonian (APA). Born & raised in Stockton, Montalvo is a documentary photographer who has photographed in the US, Asia & Europe. His photographs on Mexican farmworkers have been exhibited at the Haggin Museum & Sacramento State University.Montalvo & Sobredo have worked collaboratively for over 17 years.